Bundle up and get ready to start your Christmas countdown because it’s a holiday celebration on Historic River Street! 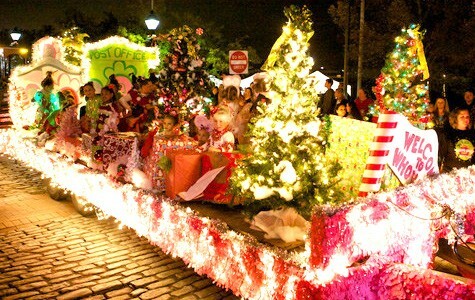 Join the Savannah Riverfront for their annual Christmas on the River & Lighted Parade on December 6 & 7! Bring your chair and blanket to kick-off the weekend with an outdoor movie presentation of Elf on Friday, December 6 at 7pm. Make sure to stick around after the movie for First Friday Fireworks presented by Wet Willie’s at 9:30pm. Rousakis Plaza will be filled with regional arts and craft exhibitors to shop for gifts and stocking stuffers to check off of your Christmas list. Special holiday performances will take place on the Arbor Stage featuring local musicians, singers and dance groups all weekend long. Don’t miss the official arrival of St. Nick during Savannah’s Annual Lighted Christmas Parade on Saturday, December 7 at 5:30pm. The parade will begin on the west end River Street and will travel throughout downtown and end at City Market. With nearly 80 units and over 500 walkers this is one parade you don‘t want to miss! Weekend festivities will kick-off on Friday, December 6 from 4-10p.m. and continue on Saturday, December 7 from 10a.m.-10p.m. This year’s festival series is hosted by the Savannah Riverfront and proudly sponsored by Verizon Wireless, Southern Eagle Distributing, Savannah Coca-Cola, Wet Willie’s, and our friends at Adventure Radio. Enjoy the Savannah Riverfront: The Way to Experience Savannah.